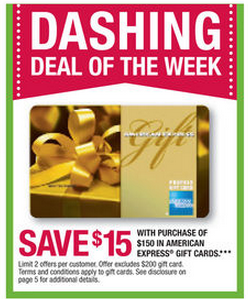 Buy $150 of gift cards this week (starts on Sunday - tomorrow) at Office Max and you will get $15 off. Buy with one of the Chase Ink Business Credit Cards and you will get 5 points per purchase. You won't make much money on the actual deal, but if you use one of the Chase Ink cards you will make a little money and then the gift cards can you be used elsewhere, effectively giving you 5 points per purchase when you use them.